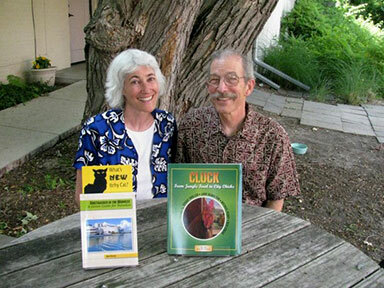 Caroline Beckett and Frank Sandner launched Itchy Cat Press in 2004. Itchy Cat Press published books that were regional, colorful, interesting, unusual, quirky and fun. Their authors told the reader the inside story, showed the other side, gave the bird's eye view. How could you beat that? Content is from the site’s 2013 archived pages providing a glimpse of what Itchy Cat Press offered its readers. We will ship within 7 working days via FedEx Ground or U.S. Post Office. If you are unsatisfied with your order and return it to us within 30 days in perfect condition, we will refund your purchase price. FRANK LLOYD WRIGHT'S MASTERWORK YOU CAN READ ABOUT... AND RENT! Frank Lloyd Wright's Seth Peterson Cottage is one of a few masterworks available for rent. Refurbished and rebuilt to exacting standards led by John Eifler, AIA, with a dedicated group of volunteers, the Cottage is a small liveable house perched above Mirror Lake in Wisconsin's state park in southern Wisconsin. Heavily illustrated with drawings, plans, and photos, including an 8-page color section, this book shows the process of reclamation, and the stunning final result. Here's a hardcover limited edition of CLUCK: From Jungle Fowl to City Chicks for the special person on your list. Green cloth cover with gold foil stamp of a crowing rooster. Stunning color artwork by S.V. Medaris throughout and stories by Susan Troller, Jane Hamilton, Michael Perry and Ben Logan. Animal lovers, pet owners and urban farmers will enjoy this funny, poignant, wry look at raising backyard chickens for eggs, meat or just plain pets. An Aside: When my husband and I decided to move to the country, we thought we would try to raise chickens for not only their egg, but also to eat. My mother sent me Cluck. I read some reviews: For animal lovers, pet owners and art enthusiasts who enjoy tales well told, CLUCK is a charming collection of essays and stories chronicling the joys and hardships of chicken keeping. It's not about how to keep chickens, it's all about why we keep chickens and the charming and challenging steps along the road from chicken innocence to experience. Read about Big Tiny, the rooster that made the hens swoon; Buff Orpingtons and Welsummers named for poets and writers; and scary creatures of the night that strike terror into many a feathered breast. So we became part of the current craze for chickens at home that obviously coincides with the trend toward wanting to know more about the sources of our food. I though that like planting a garden or buying from a farmers' market, keeping chickens would give us a sense that we have some control over that most basic of needs: providing nourishing food for the table. We do love eggs. My friends looked at us askance knowing that I am a germaphobe, carrying disposable disinfecting Clorox wipes wherever I go. Thank goodness I have found a great online store where I order boxes of wipes, as well as a number of other janitorial related supplies including trash bags, all sorts of eco friendly paper goods and cleaning supplies. which will be quite useful living out in the country. I won't be able to run downstairs to the corner drug or hardware store. Jump ahead a couple of years. It turns out that keeping chickens isn't just about being virtuous or nostalgic, it's also surprisingly fun. Sure there is a lot of work, but with their variety of vocalizations, their fundamentally whimsical behaviors, and their interesting interactions with each other and the natural world chickens are undeniably entertaining. And the taste of fresh eggs, right from the nest, can't be beat. Sure I still carry my wipes where ever I go, but I have become less obsessed about bacteria, some I have discovered are our friends - think compost. I still enjoy rereading Cluck and never grow tired of looking at the beautiful illustrations that are honest, quirky, and full of character. What I appreciate most about the stories and Sue Medaris' stunning art, though, is the love and understanding of all animals, not just chickens, that shines through. Honest, Wholesome Comfort Food —that's easy to make! lBue Plate Diner—comfort food for the 21st century. A fun and simple to follow book with great recipes and a 1950s look. Folds flat for easy cooking. Colorful throughout, with colored tabs and sections including Soups & Salads, Big Bowls, Sandwiches, Pasta & Entrees, Kids & Desserts. Delectable pastries await you at Craverie Chocolatier Cafe, Kohler, Wisconsin. Mary Bergin, intrepid travel writer, has ferreted out unusual, fun, eccentric, and green nooks and crannies throughout the Midwest. The eclectic mix of content includes low-budget to luxury eco-aware projects in rural areas and cities. Bergin examines four categories of ecotourism: food and drink, lodging and retreats, nature and wildlife, and the old and the new. She lists destinations that meet LEED standards, recycle and refurbish old buildings, serve locally grown food, operate off the grid, make selfless choices, and show respect for nature.